So, few months after Sunway Berhad decided to list its construction arm, the group finally announced the shareholders' circulation on last Friday. Barring any unforeseen circumstances, the listing of SunCon will be around mid July. So 3-4 months later. There are 2 scenarios mentioned in the announcement, namely minimum and maximum which depends on the possibility of share buy back exercise, ESOS options and conversion of warrants which affected the no. of ordinary shares of Sunway group. The final retail price and institutional price are expected to be announced within 2 market days from the price determination date. Since majority of the proceeds raised will distribute back to Sunway's shareholders as special dividends, I guess the amount will be the focus of the shareholders. Based on the latest 4th quarter report of Sunway group, the no. of ordinary shares is 1.727 million. Thus, dividing the amount by the outstanding shares gives 24.7 cents and 21.87 cents as special dividends respectively for minimum and maximum scenario. There will be slight deviation as a result of conversion of warrants and ESOS as well as share buy back by the group if any. Bear in mind after the exercise, the equity interest of the group in SCG will be diluted to 51% from existing 100%. Based on the latest 4th quarter result of Sunway group, the construction division contributed RM1.75 billion revenue and RM113 million net profit to the group. 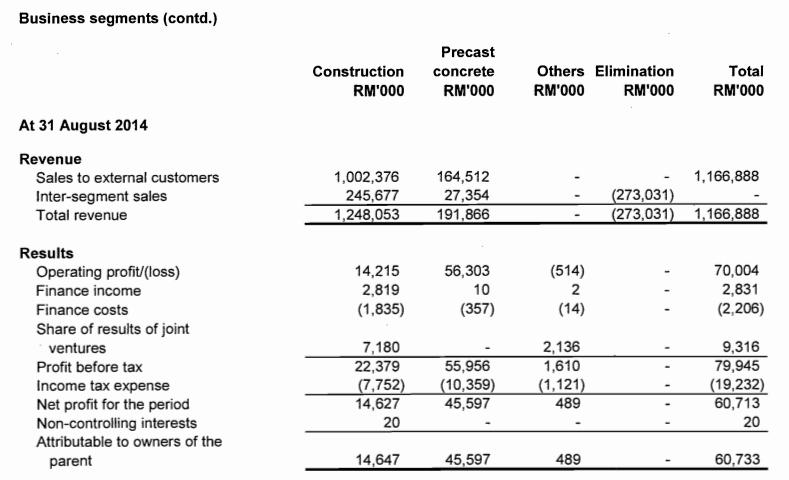 So after the exercise, it will roughly cut into half for the profit attributed to the Sunway's shareholders contributed from the construction division. Apart from the distribution, the group also attached the financial report of SunCon group. 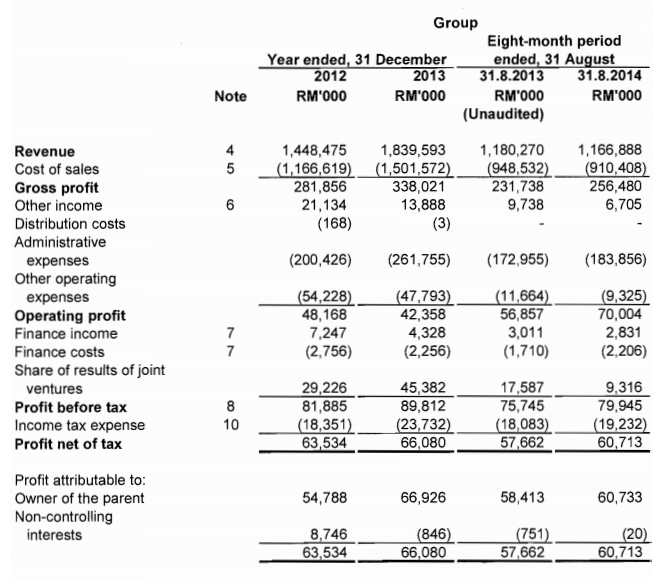 For the audited eight months period ended August 2014, the group made around RM60 million net profit, giving it 22% and 5.2% gross profit margin and net profit margin respectively. Operating cash flow was at negative territory at 8-month period ended Aug 2014. Take a look at the segment reporting will give you some slight idea on what to look for. The construction division only reported a mere 1.17% net profit margin compared to 23% for its precast concrete division. The earning quality for its construction division is just not too good for me. I would expect the construction division would fare better since they perform piling works themselves rather than giving out to other players like Pintaras or Ecopile. The net profit contribution from precast concrete to SCG group is hopping 75%. So, the performance of SCG group is highly depends on its precast concrete division. That why I also like OKA Corp who is also involved in precast concrete business. But one thing need to take note is the precast concrete division is highly depends on its plant in Singapore and it supplies primarily for the HDB public housing projects and some private sector development projects. With the slow down of development of HDB projects in Singapore, I think the division will have a hard time moving forward. 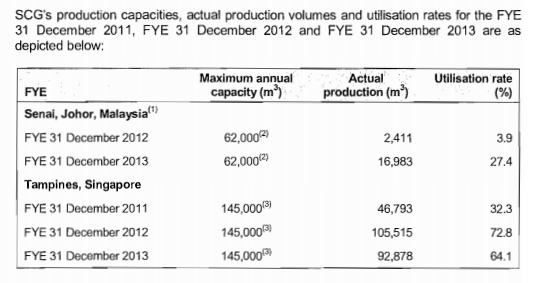 Bear in mind that the utilisation rate never reach 80% before as stated for the past few years. So, probably I will consider to sell SunCon off after its listing, no intention to hold long.